is modern handheld radiostation for tactical communication at the VHF frequency range. This small size, lightweight and easy to use radio is ideal personal radio for soldiers especially for company and platoon levels of the armed forces. Radiostation operates in 30 ÷ 88 MHz frequency band on one from ten preprogrammed channels. Radiostation provides the following types of communication: clear voice communication, scrambled voice communication, digitized voice transmission and data transmission. All electronic modules of radiostation are made in SMD technology. The equipment can be used in any region of the world; in very harsh environments robust die-cast aluminum housing is sealed to resist dust, sand, water and humidity. It withstands shocks and vibrations, immersion, heat and cold. It can be dropped and withstands thermal shocks. Tests are carried out according to military standards (MIL-STD 810E, STANAG). radiostation can be used not only as handheld but also as vehicular device. The set consists of radiostation, 0526 vehicular adapter, 0525 power amplifier and 0529 active speaker. Radiostation can be easily installed in vehicles using adapter, by which radiostation is supplied from board network 12V or 24V. Power amplifier enables amplification of transmitted signal even up to 50W (0,3W, 1W, 3W, 5W, 20W, 50W -depends on configuration). Using these two elements it is possible to create high power vehicular set enabling communication on extended territory. It enables realization of all radiostation functions with simultaneous team or platoon range increasing. The set can be offered with additional accessories such as COT 207 microtelephone or 01316 headset simplifying radiostation use. Vehicular wide-band antenna 30-88 MHz, fasten base and transformer 0206/4 (12V/24V) are also available. Supplying military troops with vehicular sets, handheld radiostations and telephone set enables creating radio-access system. set, as a part of telephone network consists of 4 devices integrated in one body: radiostation, 0526 vehicular adapter, 0525 power amplifier and 0411 telephone interface. It enables connection between radio - subscribers and telephone network and telephone subscribers with radio network. Radio - subscriber can dial telephone subscriber's number and get connection with a use of telephone set connected with telephone network. Communication can be done automatically or manually by the dispatcher. SR3501 system is configured on PC computer with managing software P97.01. Programming of all SR3501 network parameters is possible (e.g. subscribers list and their authorization) and 3501 radiostation parameters. radiostation can be used in very comprehensive way. The simplest solution is using it by soldiers as personal way of communication. On the basis of radiostation it is possible to create tactical networks of communication, co-operating with other systems, e.g. PR4G. Additional devices, special accessories and different software are increasing its functionality and possibilities of use. VHF/FM manpack transceiver with a high level of ECCM protection ensures reliable transmission in a dense electronic warfare context and offering the widest range of high-level services. This transceiver is part of PR4G family which includes complete range of transceivers that are interoperable in all modes (handheld, vehicle, airborne), set of peripherals, tactical data terminal, and a broad range of accessories, to satisfy the most varied needs. 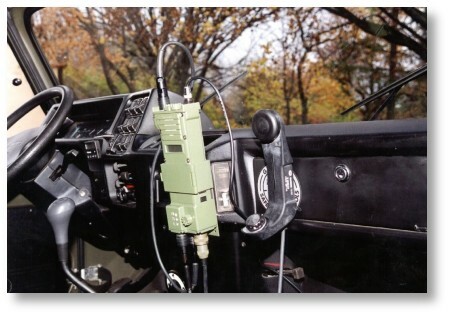 VHF/FM, compact vehicle transceiver with a high level of ECCM protection ensures reliable transmission in a dense electronic warfare context and offering the widest range of high-level services.